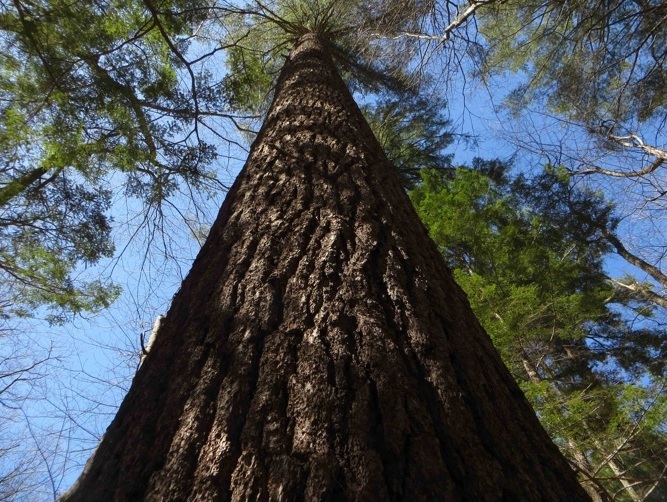 The eastern white pine (Pinus strobus) is the tallest growing tree species in the northeast; in fact, currently, the tallest living thing in New England is a 175-foot white pine growing in northern Massachusetts. In early colonial times, Britain had long been exploiting the European supply of Baltic pine or "Riga fir" (P. sylvestris), from which masts for her warships were fashioned, and the supply was becoming strained. A dependable source of shipmast trees was badly needed, and the newly discovered eastern white pine in the American colonies was just the ticket. 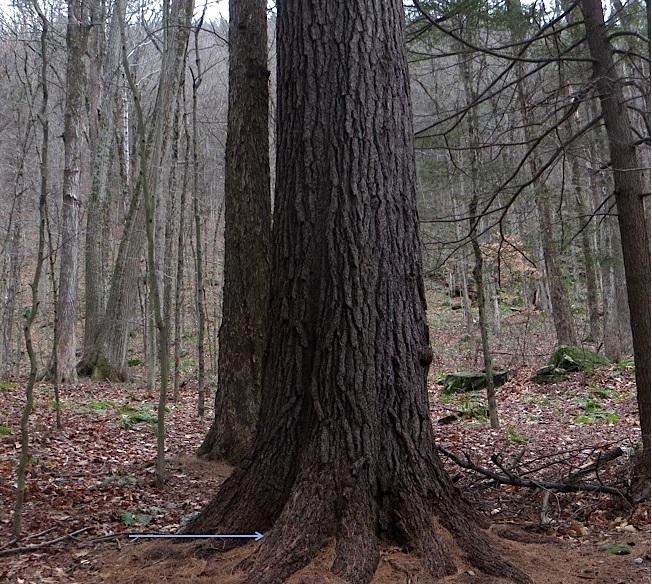 This was the tallest conifer species in all of eastern North America. Masts 40 inches in diameter and 120 feet tall (weighing up to 18 tons) could be readily obtained from these soaring, straight trunks. 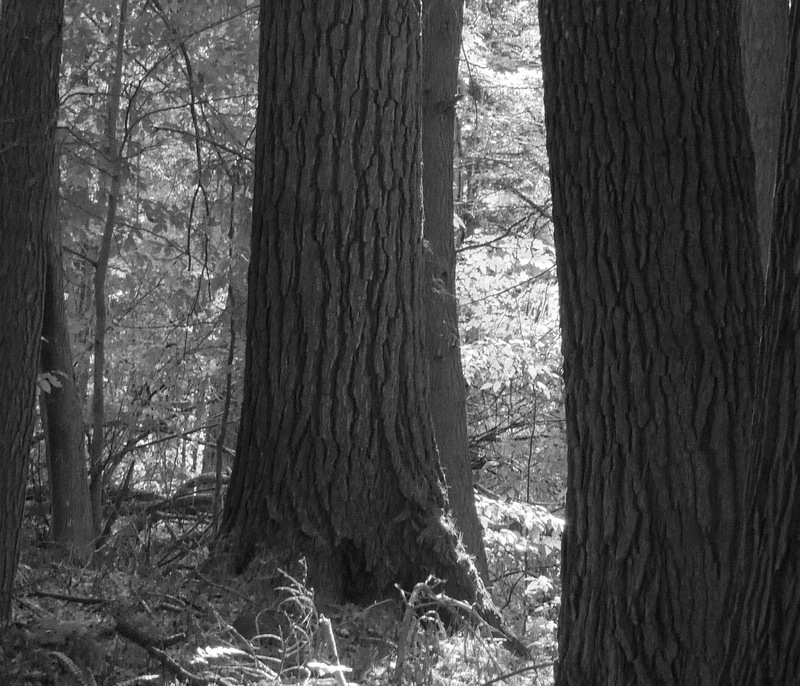 Massive white pines, straight as a sunbeam, were also highly prized by the colonists for the superb timbers and lumber they could provide, their wood being easily worked; it was light, and strong for its weight. The fledgling colonies sorely needed the pines for building materials as much as the British navy did, albeit for different purposes. The original, primeval stands of virgin pine were relentlessly clear cut, beginning along the New England coast, going north and west from there. Through the 1800's, central New England was rapidly cleared for agricultural land, to the point where only about 20 percent of that area retained any forest cover. Big pines were no more. With the opening of the Ohio valley in the latter part of the nineteenth century, New England farm land was largely abandoned, and reverted to forest. Many fallow fields seeded in with white pine, eventually resulting in the next round of white pine logging in the early twentieth century. And today, white pine lumber is still in high demand. One of the downsides of large tracts of pine growing in open, abandoned fields is that the flush of young pines growing in full sun is a boon to an insect known as the white pine weevil (Pissodes strobi). The vigorously growing saplings are highly susceptible to the onslaught of this weevil, and are a vital part of the insect's life cycle. 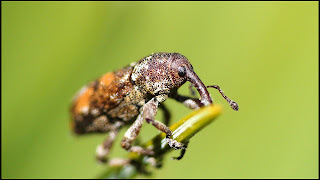 In spring, adult weevils feed on the tissues of the uppermost shoot and terminal buds (last year's growth); that in itself might not do much damage to the shoot or tree. However, the adult females chew pinholes through the tender bark and cambium layer of the shoot and deposit eggs in them. This is where their young will develop and feed, and there may be hundreds of them in one shoot. The larvae will feed in the soft, developing tissues under the supple bark, which kills the terminal shoot; when they mature to adults, they chew their way out. A pine tree, like most conifers, is programmed to grow one trunk, straight up, by elongating the topmost terminal bud (and growing a whorl of side branches at its base), eventually ending the growing season with a new set of terminal buds for next year's growth. But when that new terminal shoot is damaged or killed, the whorl of side branches below it curve upward to take over the role of upward-growing leader. Problem is, now there are typically two or more trunks instead of one. It's great real estate for the next generation of weevils, but a severe blow to the value of the tree for man's uses. If you've ever wondered why some pines are single-stemmed and others are multi-trunked, you now know the original terminal shoot was either killed or broken. 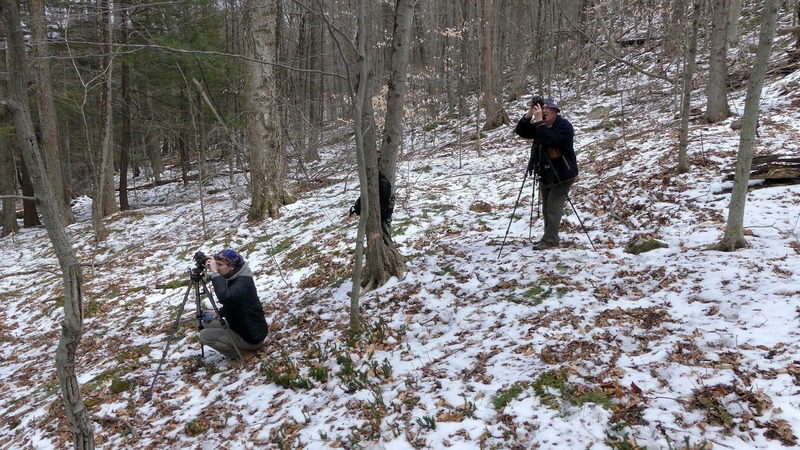 If you'd like to see the weevil's life cycle, then you'll want to watch the latest New England Forests film, "The White Pine Weevil". 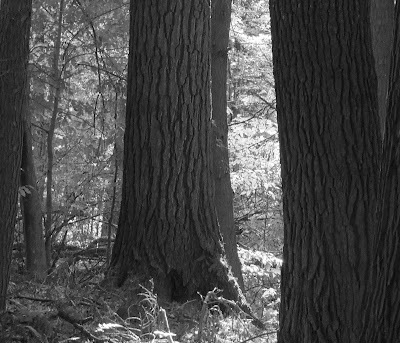 Click the player below (may not be available in email feeds), or it can be found at our Youtube channel (www.youtube.com/c/NewEnglandForests). Feel free to leave comments on the blog and/or at the Youtube film. 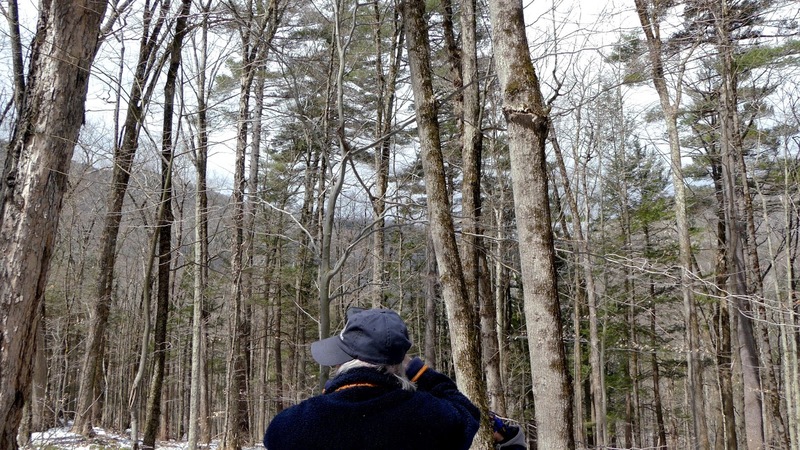 The following is an essay by guest contributor Bob Leverett, the eastern (U.S.) old-growth forest "guru". What comes to mind at the mention of New England: the region’s rich history, culture, scenery? All of these, but what about its forests? Were it not for our brilliant fall colors, I doubt many people would visit us to see our woodlands. 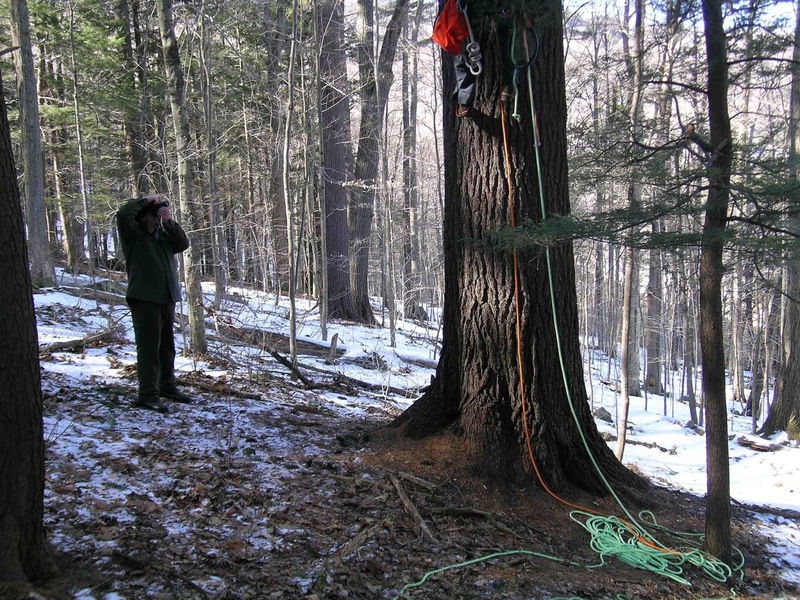 New England’s forests are not associated with exceptional trees. But it wasn’t always this way. In the 1600's and 1700's, chroniclers described a landscape that featured giant pines, some claimed to be well over 200 feet in height. In fact, the eastern white pine (Pinus strobus) was the foremost symbol of the region’s original virgin wilderness. 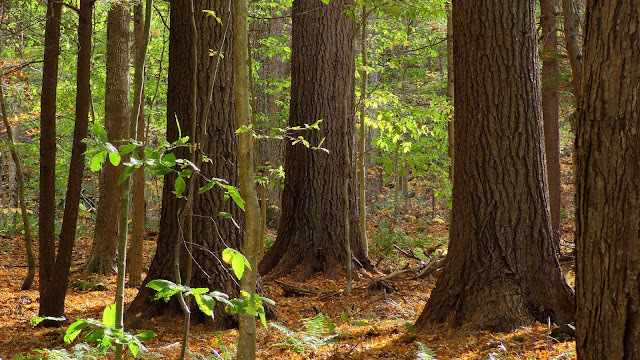 Today’s forest historians relegate those giant pines to the pages of history. Romantic accounts abound of white pines, especially in Maine and New Hampshire, reaching astounding sizes and achieving great ages, and of course, the species was famous as a resource for ship masts. The great whites became the replacement for the exhausted European Riga Fir (actually Scotch Pine, P. sylvestris) used by the King’s Navy to hold up the sails of its war ships. Trees of a certain size and shape were reserved exclusively for the Royal Navy. They were often marked by three slashes of an ax, called the broad arrow markings. But the time of those legendary pines came and went. The intense lumbering of the region, especially in the 1700's and 1800's, left us with young regrowth woodlands. By the early to mid-1900's, most of our New England forests were populated with younger trees. Field guides of the time often described the white pine as a tree capable of surpassing 100 feet in height, but often listed current heights as commonly 75 to 100 feet. More descriptive authors like Donald Culross Peattie reminded us of the historic heights, but most of these authors made it clear that no such trees still existed. In fact, the stature of the species had been so diminished that one hiking guide to trails in New Hampshire boasted of a pine that was purportedly 125 feet tall. This lone tree was considered the rare exception at the time the guide was written. To make matters worse, today’s management paradigm aims at keeping our woodlands young and shrubby, said by timber interests to be a healthier state than when trees reach their maturity. Yet, for many reasons, our forests are offering up some surprises. 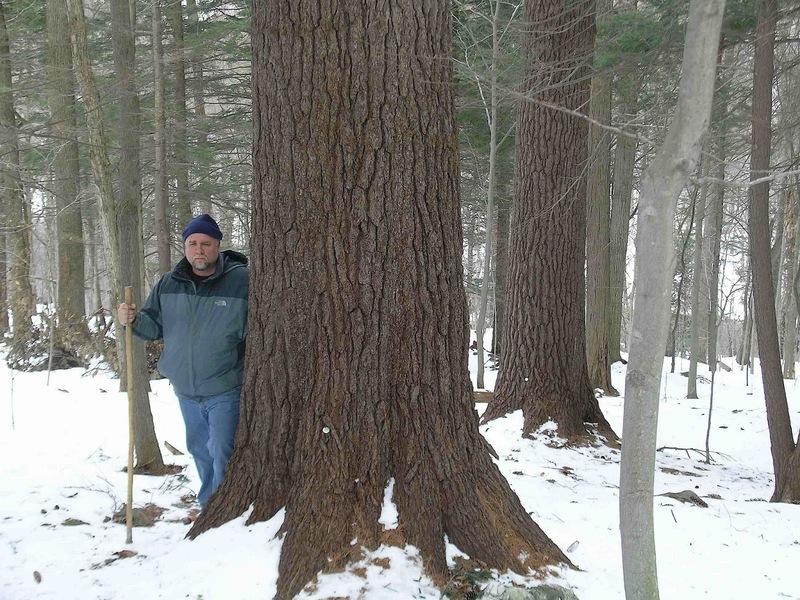 The biggest one may be the re-emergence of the eastern white pine to reclaim some of its former glory. So, what is today’s story about this charismatic eastern species, and more particularly, where do Massachusetts’s pines fit into the narrative? 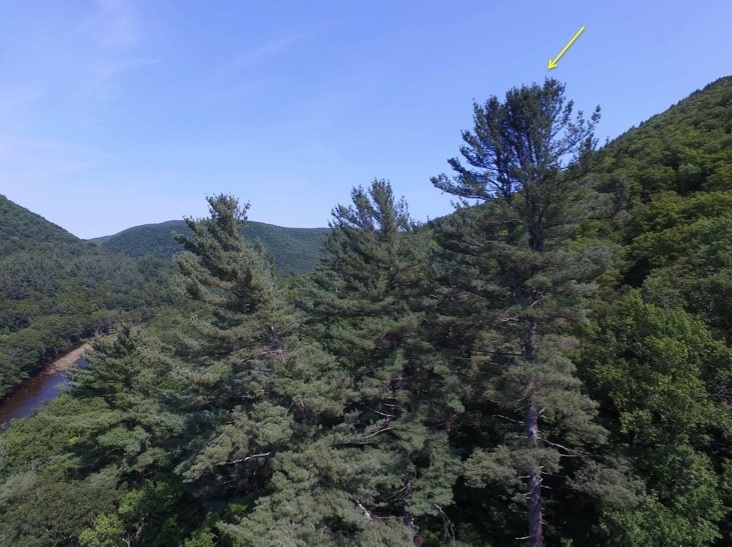 In conservation areas, parks, state forests, and even on private lands, the great whites are maturing, and one of the best places to see them is Mohawk Trail State Forest (MTSF), located in the MA townships of Charlemont, Savoy, and Florida. How large do these regrowth pines get? Do any approach their historic sizes? This question will in part be answered by my account of the re-measuring of two of Mohawk’s largest. 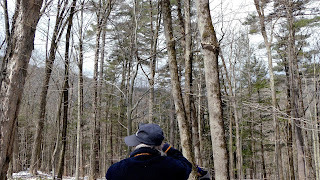 On April 18, 2018, Ray Asselin, Jared Lockwood, and I went to the Elders Grove of white pines in Mohawk Trail State Forest. The visitor reaches a cluster of conspicuously larger trees after a 10 to 15 minute walk on a trail paralleling the scenic Deerfield River. On the 18th, this path was slippery with recently fallen wet snow. The compromised footing presented me with challenges for my new knee. Yet, I was anxious to get as much measuring done as possible before the hardwoods leaf out. The veil of dense green of the hardwoods 50 to 100 feet above the head makes re-measuring the overstory pines that thrust through the hardwoods very difficult, if not impossible. My first task was to re-measure the Saheda pine. Saheda is the name of a Mohawk ambassador who was murdered in the late 1600's when he was on a mission of peace to the Pocumtucks at what is now Old Deerfield. I thought the historic Saheda deserved a tree named for him in the Elders Grove, and in my Native Tree Society (NTS) capacity, chose arguably the handsomest pine in the grove. Saheda is located above the trail, near two others: Sacajawea and Ouray. On this visit, I wanted to record Saheda’s current height before the onset of the growing season. I closely monitor this great tree and have for years. I’ve watched Saheda and other pines in the grove climb upward since the late 1970's, but it was in the mid-1990's when we began measuring Saheda with serious intent. In 1998, Will Blozan, President of NTS and an arborist extraordinaire, climbed and tape-drop measured Saheda. At that time, we confirmed Saheda at the eye-popping height of 158.3 feet. Based on what we believed white pines to be able to achieve growth-wise in the modern era, this was exceptional. Only one other tree we knew of topped Saheda - another white pine, also in MTSF, named for Mohawk chief Jake Swamp. Will had also climbed and tape-drop measured Jake to a height of 158.6 feet on the same visit when he climbed Saheda. The two trees were neck and neck, and so far as we knew, the two tallest in Massachusetts, if not all New England. We were still influenced by the descriptions of forest historians and government resource managers who continued to maintain that the species was still in its youthful stage throughout New England, save for older pines growing on very unproductive sites – small trees. We’ve watched both pines, Jake Swamp and Saheda, exceed 160 feet in height, and more recently 170. Neither shows signs of slowing down. However, for me, as the years passed, it became apparent that Jake was growing a little faster than Saheda. That seemed to fit with the differences in their ages. Jake is about 160 years old and Saheda, around 185 or 190. To put a finer point on the numbers, Saheda’s growth rate has averaged 8.46 inches per year since Will’s climb in 1998, and Jake has maintained an average of 9.6 inches since 1992. Most forestry professionals expect pines the ages of these trees to be growing at maybe 5 inches in height per year. My last measurement of Saheda, taken with a laser rangefinder in July 2017, set its height at 171.4 feet. However, I didn’t use my tripod on that measurement, which made exactly hitting the target a challenge. I had gotten numbers as low as 171.0 feet and as high as 171.8 feet, with one measurement at exactly 171.4. When you press the “fire” button on a laser rangefinder or hypsometer, you can pull the instrument down slightly. On any given measurement, that may or may not happen, but it is a potential source of error. Anyway, the 171.4-foot height seemed a reliable number to settle on, so I proclaimed it as Saheda’s height. But on this visit I carried my tripod so that I could control handshake and the button-press sources of error that invariably accompany measurements when instruments are handheld. 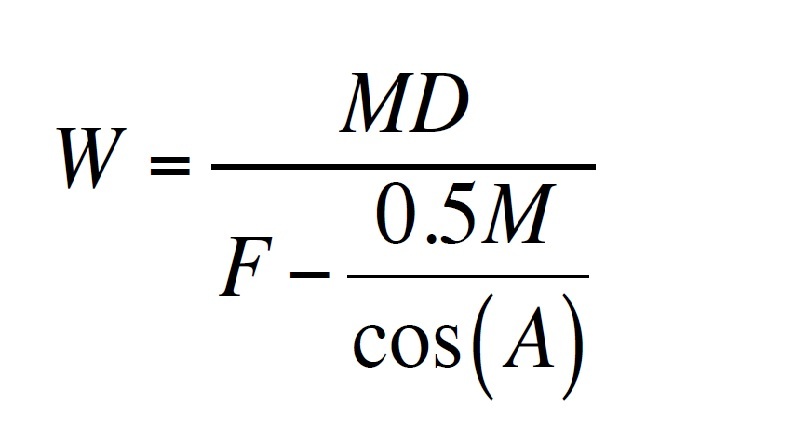 where M = reticle reading, D = distance to middle of trunk, F = manufacturer’s reticle factor, and A = angle above or below eye level of width line being measured. On this visit, our double objective was to fix Saheda’s height prior to the onset of annual growth and to re-model the pine for trunk volume, which required the trunk width measurements. Finding a good location to see the left side of Saheda’s crown, I set up my tripod. I could see Saheda’s silver id tag near its base, so I was set. Below is a view of Saheda’s base and the location I use to choose an exact spot on the ground from which to measure height. An argument can be made for setting the base point lower to match the slope of the land. I choose to be conservative on this point. From locations within 200 feet, necessary for seeing both top and base, the highest crown points of Saheda are the real challenge to see, let alone measure. However, from a much greater distance, its complex double crown stands out. Below is a view of the top taken from well upstream. You can see where I’ve marked the top. But, again, seeing that sprig from much closer requires both work and luck. Part of the challenge becomes clear when one realizes that the area of twigging with candidates for the absolute top can cover as much as 100 ft2 on these larger, older pines. At their widest, mature white pine crowns are typically between 40 and 55 feet, although the points of maximum width are well below the top. Still, the area that includes the highest twigs often presents many choices. On older pines, there is seldom a branch that is clearly the tallest from one’s vantage point, and even less often is it centered over the trunk. Crown breakage and re-sprouting is the norm. Here is an interesting fact. For visitors to Saheda, seeing the tree from a distance seldom seems to make much of an impact. A four-foot wide trunk seen from 200 feet away looks like a stick. One needs to get up close for impact, and looking directly up its trunk is when you experience an OMG moment -and that still occurs for me. In my opinion, Saheda is all that a white pine can hope to be. When I first took my friend Tim Zelazo (now retired from MA-DCR) to see the tall pine, he looked aloft into its crown, and was an immediate fan of Saheda. Tim was no stranger to the Berkshire’s forests, but the Elders Grove had escaped him. Gazing upward, this is what he saw. From my vantage point, I was able to shoot to four identifiable tops of Saheda’s double crown, all on the uphill side of the crown. One conspicuous tip gave me a reading of 128.25 feet above the centroid of the TruPulse. I asked Ray to confirm the measurement, which he did. Turning the TruPulse on the axis of the tripod and shooting to Saheda’s metal tag, the height below the centroid read 40.5 feet on the display. The height of the tag above the point I use as Saheda’s base, as shown in the first image, was 3.0 feet. The three numbers add up to 171.7 feet! Saheda hasn’t grown since July 2017. The difference between the 171.4 and 171.7 probably lies in the use of my tripod, which gave me a sturdier platform to shoot from, as previously explained. In addition, this time my vantage point was different. Regardless, there isn’t a dramatic difference between 171.4 and 171.7. Still, when you are the second tallest living thing we know of in all New England, inches matter. 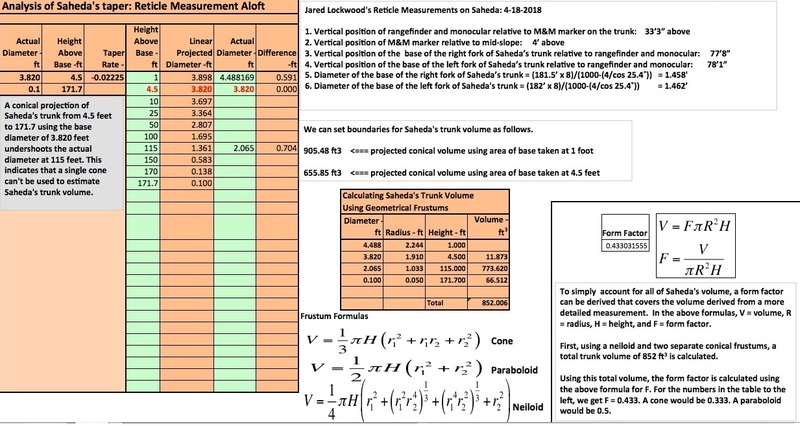 Our second challenge was to update our calculations on Saheda’s trunk volume. With updated figures, we would then: (1) convert volume into total woody mass, (2) derive the carbon portion of that mass, and (3) calculate the amount of CO2 pulled from the atmosphere to build the trunk. The next chart shows our calculations, followed by more explanatory comments. The process and calculations are shown here to explain the methodology. Skip the chart if you are not interested in these technical details. 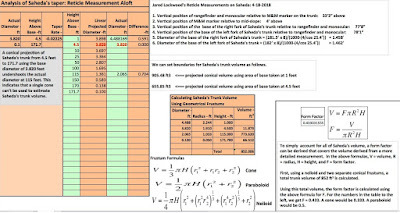 The newly calculated trunk volume of Saheda is 852 ft3. I had been using 825 ft3 before based on cruder measurements. Limbs add between 5.5% and 6% of the trunk’s volume. Using 5.75%, I arrived at a trunk and limb volume of 901 ft3. Taking an average density of 24 lb/ft3 (that number varies from around 21 to 29), we get a total trunk mass of 21,624 lbs. If 48% of the total mass is elemental carbon, this yields 10,380 lbs. The amount of CO2 needed to deposit the calculated amount of carbon in the trunk and limbs is 10,380 x 3.67 = 38,095 lbs or 19.05 tons. For the modest sized rectangular area that Saheda takes up on the landscape, we’re getting a very good environmental return on the physical space. I’ll leave Saheda with a final picture of the pine and my late, great friend Gary Beluzo, who was an environmental studies professor at Holyoke Community College, where I also taught as an adjunct for 24 years. 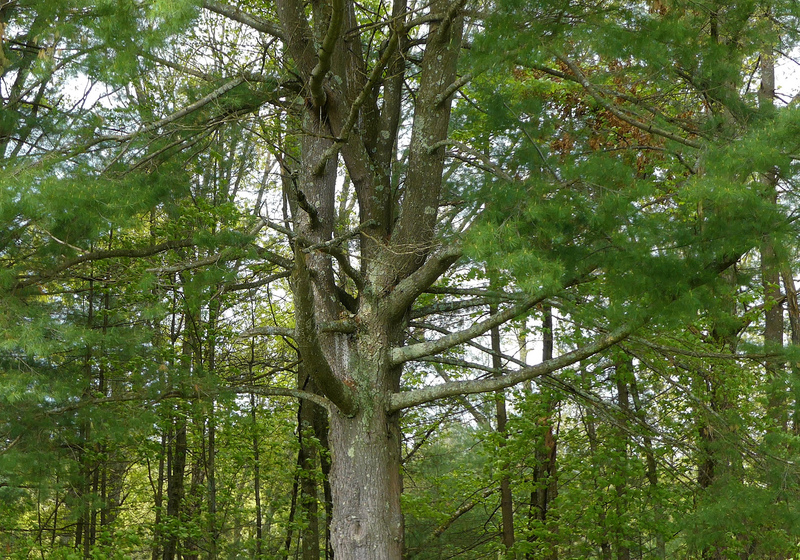 One of the two other trees we re-measured was Tecumseh, named for the famous Shawnee chief of the early 1800's. Tecumseh was a charismatic figure. It is still difficult to get his full measure. Tecumseh’s tree is no less impressive, but it is even harder to measure than Saheda. In the past, I had established its height at 166.8 feet, but on this visit, I could only get 165.5 feet. We noticed that Tecumseh had experienced a lot of limb pruning, and I believe that it has lost crown. For now, I’ll stay with 165.5. Tecumseh has been climbed and tape-drop measured by both Will Blozan and Bart Bouricious. Like Saheda, Tecumseh achieves a 12-foot girth at breast height. My current estimate of Tecumseh’s trunk volume is 849 ft3. Below is an image of the base of Tecumseh when my friend Bart Bouricius was climbing and tape-drop measuring the tree. DCR’s Tim Zelazo photographed the event. We measured another pine, hitherto unnamed, growing a short distance south of Tecumseh. I last measured the nameless one in 2010 when it was 152.6 feet. Today, I got 155.3 feet. This pine has averaged a modest 4.6-inch annual height increase. Obviously, not all the pines are growing at Saheda’s rate. However, most are growing at least a half a foot per growing season. We named this pine Washakie after the great Shoshoni chief. It measures a respectable 10.3 feet in girth, and has a trunk volume of between 550 and 575 ft3. I felt satisfied with the naming choice. Monica and I have visited the Wind River Reservation in Wyoming on several occasions, and I have long admired Washakie. He was a true leader. In terms of honoring the past Native Americans with trees in the Elders Grove, we now have Saheda, Tecumseh, Sitting Bull, Crazy Horse, Sacajawea, Ouray, Osceola, Wampanoag (unspecified), and now Washakie. The other larger trees will eventually acquire Native American names. Our reason for naming the trees after Native Americans is simply that the custom seems appropriate. The great white pines of yesteryear were abundant when indigenous people were in control. Also, the Mohawks proclaimed the eastern white pine as their tree of peace, and the Algonquin-speaking nations held the species in no less esteem. Additionally, the indigenous peoples found sustenance in the underbark of the pines as a food source. Today we are discovering that the compounds of the pines released into the air have health benefits. In terms of naming all the pines, we don’t want to rush the process, though. It would be counter to the ceremonial state of mind that I associate with real Native teachers. Is There a Higher Purpose Behind Our Measuring and Modeling? Why do Ray, Jared, and I spend so much time with these lofty pines, and in particular Saheda? 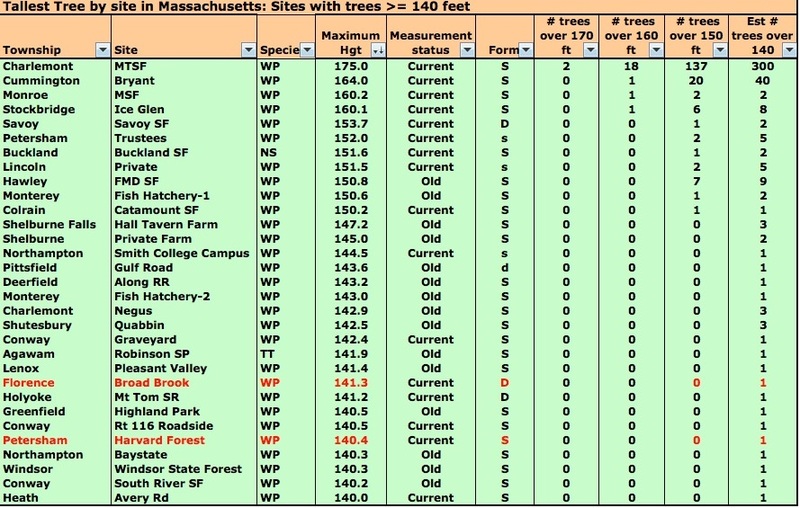 Each of us has his reasons, but an especially important one for me is that I find it unacceptable that in 2018 such a great tree should go unrecognized in a state as highly educated and foresighted as Massachusetts. The visibility and importance of Saheda and his companions have largely been lost to our fixation on the presumed need to “manage” all our forests - too often a euphemism for exploitation. Those of the latter mindset do not understand the full range of the ecological services provided by our biggest trees. These forest monarchs provide habitat for a range of species, sequester more carbon than their junior counterparts, protect the genetic heritage of their species, moderate the climate around them, and provide heretofore unrecognized health benefits to those who walk among them. They appeal to our artistic sense and spiritual nature. No less a personage than Henry David Thoreau understood their place. People can disagree on Saheda’s value along subjective lines such as aesthetics, but Saheda’s role in sequestering carbon should not be in doubt. That alone gives us an immediate reason for valuing it and the other big pines of the Elders Grove. Saheda and Tecumseh debunk the mistaken, and often self-serving belief that the larger, older trees are senescent: holding, but not adding carbon. They are adding, and adding a lot, and we will continue to keep track of the amount. I’ll close this topic with some unsettling observations. I wish I didn’t feel the need to make them. All people and professions knowledgeable about forests should find inspiration in places like the Elders Grove. Those splendid trees should be valued for historical, cultural, aesthetic, and ecological reasons. But sadly, much of modern forestry discounts the ecological role of trees in their maturity. The profession actively promotes early successional habitat, while at best, paying lip service to its late successional counterpart. Obviously, timber people can’t wait 100 years and more for trees to fulfill their ecological role before cutting them. So, practically speaking, most of our forests have to be managed on shorter rotations if we’re to continue enjoying wood products. Still, one would hope that the professional forestry organizations would publicly support a nontrivial percentage of our forests maintained as late successional. Yet today we are seeing a growing number of forestry voices promoting the use of trees to generate heat and electricity. They claim biomass to be carbon neutral. It clearly is not, and the mental gymnastics that supporters of biomass go through to justify their illogical claims are wholly unconvincing. As long as outdated and mistaken beliefs about the growth rates of mature trees are publicly promoted by resource managers attempting to justify logging it will be necessary for us to ‘publicly’ set the record straight. This essay is primarily about the Elders Grove pines and more particularly Saheda, Tecumseh, and Washakie. However, in the introduction I alluded to the return of the eastern white pine in Massachusetts as our true New England forest monarch. 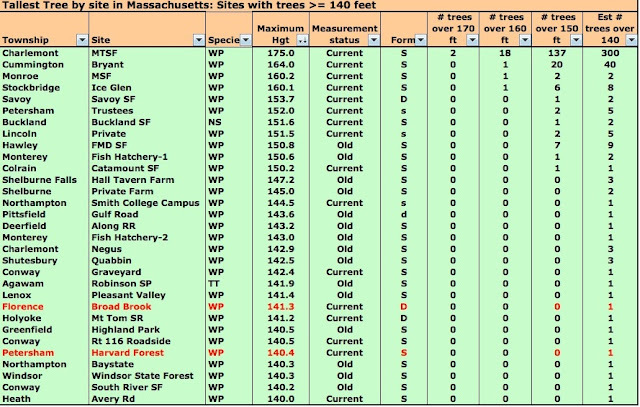 I will conclude with a list of all the sites we have documented in the Bay State with pines in the height range of 140 feet or more. This list constantly changes, but in the direction of an increasing number of locations. As shown in the table, many of our measurements are old, and we do not believe that we’ve exhausted the current number of "140" sites. There may be as many as 50 statewide.